As an alternate approach to enterprise data protection, vendor ClearSky Data combines on-demand primary storage with offsite backup and DR, delivered as a complete fully-managed service. 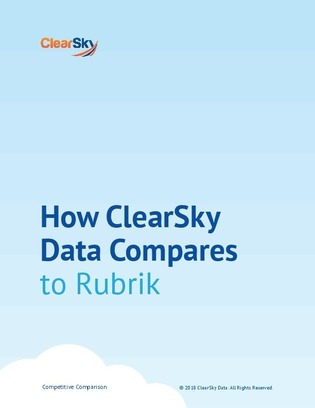 But how does it compare to the more traditional backup vendors, such as Rubrik? Access this paper to find out. Inside you’ll find a 12-point feature comparison, as well as a head-to-head breakdown of performance, physical footprint, scalability, cloud integration, and the cost of the two.